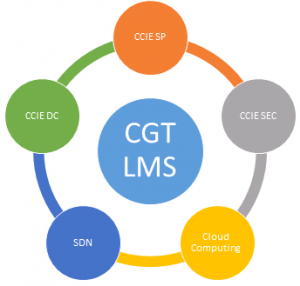 CoderGenie Technologies brings to you revolutionary Learning Management System (LMS). With LMS, candidates can do the self paced learning for the selected course anywhere anytime over the internet. LMS comes with a various subscription models for various topics. CoderGenie Technologies have created a new LMS solution that is not just self paced but Instructor Guided Self Paced Learning (IGSPL). There will be an instructor assigned to a course who will be available to work with you with any queries you have. The LMS solution also has integrated topic based quizzes which will keep a tap on your learning curve at all times and see the concepts are being understood at all times. Every section and every sub-topic of each section is provided with theory which helps you build core understanding and build foundation not just from the perspective of passing certification exams but help you become an expert on real network deployments. There are various courses for Cisco Certifications, Cloud Computing (OpenStack), Programming, etc. Each section is backed by references of documentations and RFC’s. The documentation links are basically links vendor specific docs, University research documents, and even various RFC’s and Drafts. Each section also has detailed lab example with complete configuration, show commands and troubleshooting steps. The lab also includes “Notes” at points which are critical and important to remember. If the user thinks a particular topic should be added as part of the LMS for the selected course, they can request our technical team for that topic and same shall be added in LMS within 3 days of the request. Every course will be assigned an instructor who will be available to answer your queries. You can also opt for a group study where in the Instructor can have a group meeting to guide you on your queries. Once you have completed your course (learning + Quizzes), you will automatically be assigned a badge and you will also gain a course completion certificate which will serve as a proof that you have completed the course successfully. For further assistance, please contact us at webmaster@codergenie.com.